My name is Lucas. I never knew my birth father, and my birth mother was not fit to take care of us. My sister and I were taken away by the state when I was two years old. We bounced around to a few foster families until we were adopted. Only a few short years later, my adoptive dad was diagnosed with lung cancer. Before I knew it, he was gone. I don't have very many memories of my father, but one of my fondest is him handing me the packets of sugar they had at the hospital. When I was six, my mom moved our family to Utah. She went there seeking help—a single mother of two young kids struggling to find her footing after the loss of my father. At the age of 9 or 10, I was molested. It went on for a while. I felt ashamed, and I didn't know how to make it stop. I didn't want to get in trouble. Luckily, my molester was caught in the act, and it stopped. I then sought help from my bishop. At 13, I wanted to take my life. My mother sent me to a treatment center to get help. I was angry, but I stopped protesting and did the 30-day program. My mother had taken me to therapy for years, trying to get me to open up about my feelings, but I wasn’t going to have any of that. I just did the program and got out. Mom got remarried, and we moved. I was not happy at all. I was in seventh grade, fresh out of elementary school. I went from the top of the food chain back to the bottom. One day after school, I was waiting for the public bus and I got in a fight with some other kids. I got beat up pretty bad. I started hanging out with the wrong crowd shortly after that. At the age of 15, I started smoking pot and drinking. When I was 17, I was onto harder drugs like meth, coke, acid, and ecstasy. At age 18, when most kids were looking forward to going to senior prom and graduating high school, I was looking at thirty-two years in prison. I took a plea bargain, and I got eight months in jail. I did okay. I quit the hard stuff. But after I was out for about a year, I got sent back and was incarcerated for 15 more months. While I was there, I attended the LDS Addiction Recovery Program. I got my GED and my high school diploma. I attended Alcoholics Anonymous, Narcotics Anonymous, and an anger management course. When I got out of jail, my life choices were not the kind that would help me stay out of jail. I figured I would either die or live my life in prison. My girlfriend became pregnant, and we decided to place my daughter for adoption. I loved her, but I wasn’t in a good place and believed she would be better off without me. A few months passed. The drinking slowed a bit. Then one day, these guys wearing white shirts and name badges showed up. They were missionaries for the Church. I asked them for information to call them back and tried calling. I lost contact with them for a while but finally found them again. “I want to be an addiction recovery missionary,” I said. My mouth had opened before I knew it. When my brain finally caught up, I wondered where that thought came from. It seemed way out of left field. I started attending addiction recovery meetings and fought hard to get sober and to live a life in recovery. It wasn't easy. I dropped the ball a few times, but I had people there to pick me up. These three, simple, yet profound principles kept coming back to my mind: say your prayers, read your scriptures, and come to meetings. If you follow these three simple principles, things you can't imagine working out will work themselves out. I applied these principles in my life. I was on the weekly visit list with my bishop for over a year. I began turning my will and life over to God and got married to my beautiful wife. We were sealed for time and all eternity, and we have a home. I also have a driver’s license and insurance. I have been sober for six years thanks to the LDS Addiction Recovery Program, and I have been a facilitator for the last five of those years. 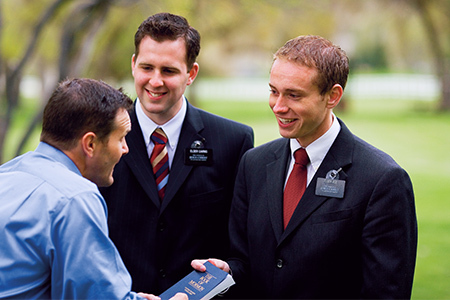 I have a firm belief that Joseph Smith is a prophet of God and that the Book of Mormon is true. I will spend the rest of my life trying to help save as many souls as I can.